Evidence-informed nursing practice analyzes the best evidence available to make a clinical decision, considering the availability of resources, taking into account the values and wishes of the patient, and evaluating outcomes. “Posing clinical questions also can help nurses identify and fill in gaps in knowledge, keep up with advances in clinical practice, and strengthen interactions with their peers, team members, and patients and their families”. McKibbon, KA and Marks, S. (2001) Posing clinical questions: Framing the question for scientific inquiry. AACN Clinical Issues, 12(4):477-481. Pre-appraised research evidence: resources that have undergone a filtering process to include only research of higher quality, and that are regularly updated so that the evidence is current. 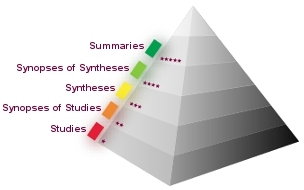 The 6S Pyramid of Evidence is a hierarchical approach with 6 levels of organisation of evidence. Evidence is ‘ranked’ in relation to quality when it is used to make evidence-based clinical decisions. 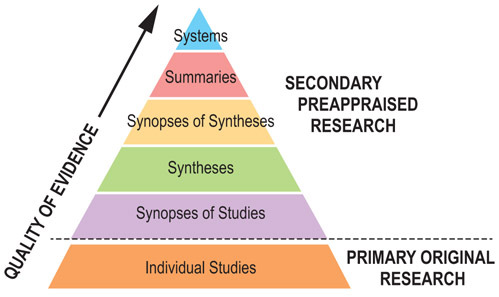 This is often known as the evidence ‘hierarchy’, and is illustrated in the pyramid below. The levels are in descending order of usefulness to busy clinicians. The idea is to start at the top and work your way down until you find an answer to your clinical problem, with the primary or original research at the base of the pyramid. If every other ‘S’ level fails to provide an answer to your question it is time to look for original studies. These include randomised controlled trials (RCTs), cohort studies, case control studies, and cross sectional studies. Accessing pre-appraised evidence: fine-tuning the 5S model into a 6S model. Evidence-Based Nursing, 2009, 12(4): 99-101. Farrell, A. (2008) An evaluation of the five most used evidence-based bedside information tools in Canadian health librariers. Evidence Based Library and Information Practice. 3(2):3-17.